I recently bought a down underquilt for my camping hammock – the Selva 450 by European lightweight outdoors specialists Cumulus. Follows a review of the underquilt in a sub-zero snowy environment. About a year before buying this underquilt, I bought a well respected lightweight camping hammock from the USA as I couldn’t find a well reviewed lightweight hammock with integrated midge/bug net in the UK. I didn’t know about Cumulus back then. Having tried to make the best of my hammock with a lightweight thermarest inflatable camping mat I already owned, I found it really hard work trying to balance on top of a sleeping mat in a hammock through the night (I am a fidgety side-sleeper). The import duty from the USA to the UK made it very expensive to buy the hammock from a UK perspective, so I wasn’t keen to go through that import duty process again with an underquilt. There are a few people making hammock underquilts in the UK, but, so far, they are relatively bulky and heavy. The best down ones seemed to be made in the USA. After a lot of research, I stumbled across Cumulus, who are making some superb lightweight outdoors gear here in Europe. The hammock took a little while to arrive after ordering, but the website warned of production lead times. On opening the hammock, the first impression was of quality materials, light weight and superb build quality. At the weight and thickness it was a leap for me to understand how this would be a three season underquilt. The 450g fill down felt really soft and lofted. The package includes a stuff sack and a really well made mesh bag to store the down underquilt in a lofted, uncompressed state, when not travelling. The package also includes a length of bungie cord to string along the side of the underquilt, making it compatible with most camping hammocks. I am planning a unique wild camp each month this year, and the first of which was in the UK’s typically coldest month, January. The overnight temperature was forecast to be somewhere between -2 deg C and -6 deg C. Pushing the three season underquilt into its low recommended temperature zone (-6deg Comfort / -13deg Limit rating) in my first outing on a snowy evening was daunting to me as a fairly lean, cold sleeper. The underquilt compressed down into a small and light mass, which easily disappeared into my winter backpack. I planned on hiking up into my location, setting up then getting straight into my hammock before the evening cooled me – I didn’t have time for a fire. Rather usefully, the attachment loops on the hammock match up closely enough with the underquilt hooks on the Dutchwear hammock so I didn’t need to use the bungie cord attachment method at all this time. The underquilt fitted perfectly under the hammock without overly compressing it or leaving a big gap between the hammock and quilt. The simple draw cords at the top and bottom of the quilt closed off any drafts. The alternative way to hang the underquilt is to use the bungie cord to hang the quilt from the hammock suspension. This would have also worked well for me as the underquilt hooks along the sides of my hammock would have clipped into the bungie cord making a snug fit. I used a 3×3 tarp over my hammock to protect from snow and offer some wind cover. I managed a fairly quick setup so was able to get into my sleeping system feeling warm, which is critical for me below freezing. I already have a down winter sleeping bag, so am reluctant to invest in a top-quilt. Using a sleeping bag in a hammock with an underquilt works fine, it’s just a little more fiddly to get in and out. A down sleeping bag is of little insulative use on the underside of a hammock as body weight compresses the down to a point it’s hardly insulating against the cold air under the hammock. An underquilt is best option. I was instantly aware of my body heat being trapped under me in the hammock. It felt quite cosy straightaway. I should have wrapped my down jacket around my neck to keep warm before sleep as my chest was the cold spot. Once I wrapped up fully for the night, I was quite warm for the majority of the night. The only cold spots were around my shoulders where cold air was getting around the baffle of my sleeping bag – try and get fully into a cocoon, hooded sleeping bag inside a hammock! 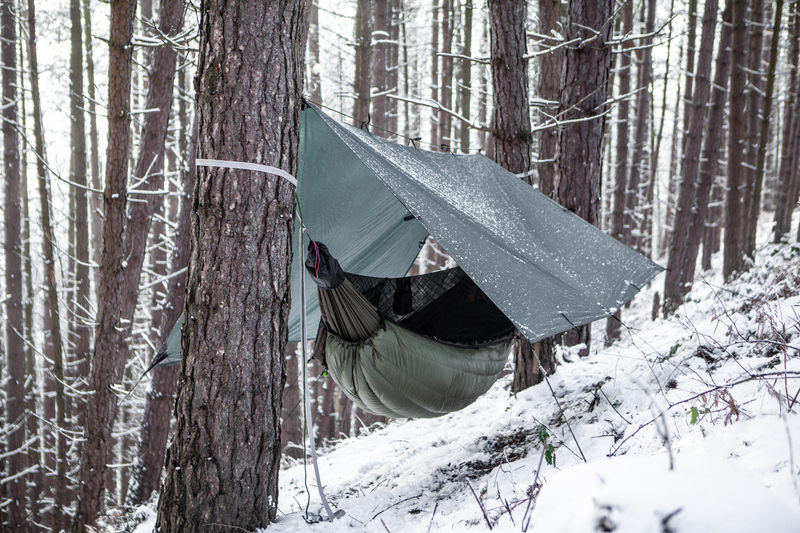 The underquilt offered a good fit under the hammock, with no cold spots on the first outing. This was reassuring as I wasn’t sure I would be warm enough as a fairly cold sleeper in temperatures below freezing. The Cumulus Selva 450 underquilt is designed to be a minimalist, lightweight down offering. If I could change anything I might like a full length sleeve along both sides of the quilt to allow a full seal against the hammock, over the 1″ bungie loops. The loops however allow more attachment points along the sides of my hammock, so actually both designs have benefits. The stuff sack could do with a pull handle on the bottom to make it easier pull the quilt out quickly but that’s a minor point. I had no idea what to expect when ordering the Selva 450 in terms of build quality and if it would be warm enough for me in UK temperatures. I was very impressed with the top quality materials used, build quality and design. In use the hammock underquilt is much warmer than I expected from a 3 season rating. The windproof Pertex Quantum is a real benefit in not needing to add a further windproof layer under the quilt, as some systems require. I think the H pattern down chambers probably add the biggest design benefit, meaning the down can loft and stay uncompressed even when fairly stretched out under the hammock – this was really noticeable as I had it set up fairly snug to my hammock. This underquilt has finally allowed me to ‘get’ hammock sleeping – being away from the frozen snowy ground, in sloping woodland with messy ground vegetation was a real eye-opener. My next steps are to add a second, summer-weight Cumulus down underquilt to my set up. The plan would be to be able to use the combination of both to cover all seasons in the UK and my visits to the French Alps and Norway. The combination of the two underquilts to push the low temperature limit down further, and either of the two underquilts individually for transition and summer camping. Watch this space for reviews of this combined Cumulus underquilt system. For a full list of the kit I used for this sub-zero winter hammock camping trip, see the winter camping list (pdf). You can find the full range of Cumulus lightweight hammock camping gear online.